My knowledge of ‘catch your own’ fisheries is lacking, at best – a few forays into overcrowded, murky ponds as a child (followed by the fear of actually catching something and having no idea what to do next) was as far as I ever got – but the little experience I’ve had has led me to be suspicious. However, the Church Paddock Trout Fishery is as lovely as it sounds. 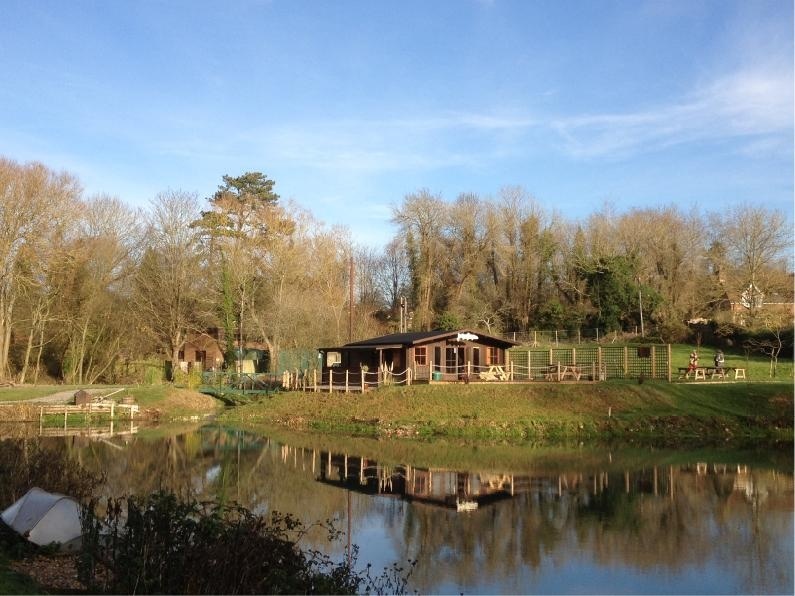 It’s a simple place, set within five acres of landscaped grounds, and from the minute you get there it feels like a place you definitely want to buy fish from. When we went on a Saturday morning there were groups of friendly local anglers, keen to show off their catch, and I didn’t feel anywhere near as out of place as I thought I might. In fact, once I got them taking about their fish, there was hardly any stopping them! We went along to buy some fish (rather than catch it ourselves) and Eddie (the helpful guy manning the counter) informed us that he’d just caught some half an hour earlier, and that he’d happily gut and fillet them for us. I should point out that we were lucky – normally you’d have to call them the day before to guarantee that they’ll have some, but they are happy to do this if you don’t actually want to fish yourself. We paid £8 for our trout, and the quality was fantastic (so much so that we turned it in to a simple raw tartare that evening) and it was as fresh as you can possibly get. They also sell smoked trout and salmon, as well as pâtés and the like, and I can vouch for these too. They are experimenting with smoking their own fish, and the result is a wonderful, thick sliced, oaky treat that is definitely up there as one of the best smoked fish I’ve tasted. If you want to go one step further than I did, then obviously you can catch your own. Prices start a £25 for a “2-fish ticket” (I’m not sure why, but I find that quite amusing), and you can hire rods, bring your own, buy a 10-fish pass or even pay for angling lessons, which Eddie was more than happy to recommend. £12.50 for a whole trout isn’t actually that bad, and when you factor in the quality of the fish, the fun you’ll inevitably have catching it, and the fact that you might – just might – catch a whopper (the price is charged regardless of the size of the fish you catch), it suddenly seems like pretty good value. In the lake they have a variety of trout, including brown, blue and even rainbow. If you want to know more, Eddie’s definitely your man. It’s becoming increasingly tricky to find ‘sustainable’ fish, and, personally, farmed fish often makes me uncomfortable – how many drugs are used to control disease in overpopulated pools? Will it taste as good as wild? But how can I be sure wild fish are sustainable? etc. etc. In other areas near the coast you can support local fishermen via ‘Community Supported Fishing’ schemes (like Catchbox) that allow them to catch what’s in season in a sustainable way, and give local consumers the chance to buy a variety of fresh, sustainable fish. Sadly that’s not usually a possibility when you live in land, so fish eaters need to look elsewhere – especially when you live in Winchester and there’s no fishmonger. At Church Paddock they don’t use any chemicals in their waters – Eddie tells me that he’d rather sacrifice the whole stock of fish than start to interfere – and from a novice’s perspective, that philosophy seems to be working. The water in the lake is clear and the fish that we saw were slick, bright-eyed and red-gilled; just what you’d be looking for if you were buying from a market or a fish counter. Enter your email address to follow the Hungry Hampshire blog and receive notifications of new posts by email.